Up until recently, it was starkly minimal, fade-into-the-background shoes that were being hailed as a fashion status symbol. But, skip to 2018 and an unlikely item that two decades ago would have been considered sartorial suicide is sweeping through the street style pack. Throughout the ‘80s and ‘90s, this style of shoe was worn exclusively by dads and, as such, became pigeonholed as the epitome of uncool. Now though, those very same chunky, bulbous and vaguely orthopaedic-looking trainers have become the must have cool-girl purchase of the year. So much so, that everyone from Bella Hadid and Kendall Jenner, to Kaia Gerber, Kim Kardashian and Hailey Baldwin has adopted the thick-soled shoe. But, exactly how did the dad trainer manage to shake off its tasteless reputation? Like most trends, this one started on the catwalk where a love for all things ‘90s saw a return to golden-era sportswear and footwear that considered ugliness an aesthetic statement. Take for instance Balenciaga’s ‘Triple-S’ – which according to StyleBop were the fastest selling item of 2017 - Kanye West’s ‘Yeezy Runner’ and Louis Vuitton’s Archlight sneakers, all of which have taken over the runways and well-dressed feet of style stars of late. According to one expert though, the dad shoe’s rise to fame initially grew out the normcore trend with Adidas’ Stan Smith – which was re-released in 2014 – the main catalyst for its popularity. “Honest to God, what could be more of a dad shoe than the Stan Smith? I mean, my dad wore them,” Elizabeth Semmelhack, a shoe historian and the senior curator of Toronto's Bata Shoe Museum told Cosmopolitan. “Even though it was revived in fashion and is basically no longer considered a dad shoe, when it came back in a few years ago that was one of the few things that gave it its edginess." Despite being super-comfy, Semmelhack adds that no one is really wearing them because of their practicality. Instead, they’re seen as the perfect antidote to fashion’s seriousness and a way for women to make a powerful statement. “The majority of people are wearing them in a kind of ironic way,” she says. “They’re super themselves, super fashionable and beautiful, and then to have on these somewhat clunky shoes creates an edgy compare and contrast. ”Women’s footwear is in a bit of an interesting moment, because the high heel is losing currency, and I do think, in part, it's related to the #MeToo movement. Despite their unwavering popularity, not everyone is convinced and many have taken to social media to express their aversion to the ugly trainer trend. 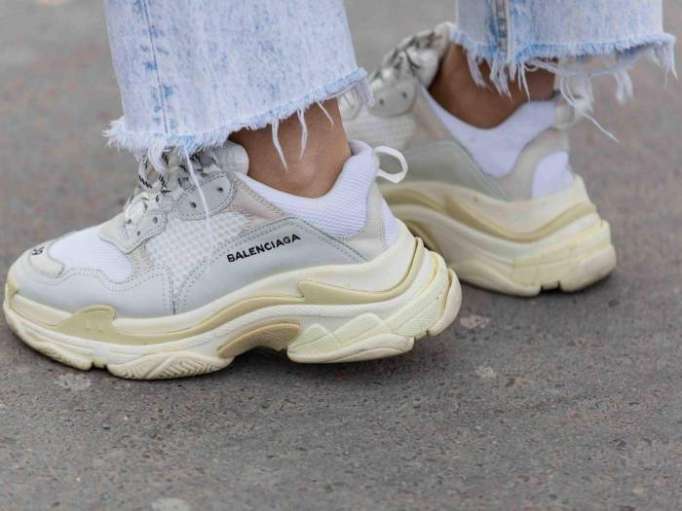 “People will literally wear anything that’s ‘designer’ them Balenciaga trainers are UGLY AF,” one person wrote on Twitter.